D.L. Hawkins and his son Micah Sanders make a rest stop at the Cafe B-B-Q on Highway 12 in rural Utah. D.L. Hawkins and his son Micah are still on the run from both Jessica and the police. Mid-afternoon, the two pull in to the Cafe BBQ to buy some food, and D.L. tells Micah to stay inside. As D.L. gets out to buy a paper, he gets a suspicious glance from a police officer who has also stopped for a snack. Spooked, he turns around to return to the car and sees Micah is missing. After finding Micah at a nearby Greyhound stop, D.L. and Micah have come to an understanding about Niki's split personality and are returning to the car. It is now night, and as D.L. moves to open the driver's door, Jessica (hiding in a tree across the street) raises her sniper rifle and fires. Jessica hits D.L. Hawkins in the shoulder. She fires again and misses. The third time she has a sure head shot and fires, but the bullet phases through D.L. 's head and blows out the car's tire. Injured, he grabs his son Micah and the money and together they run off. By the time Jessica makes it to the car, they are gone. After confronting Jessica in the forest the next day, Niki has taken control, and the three peacefully return to the clearing across from the diner. Micah stumbles, and D.L. stops to help him. In that short time, Niki turns herself in to a Utah highway patrolman across the street at the Cafe BBQ, and confesses to murder. Cafe B-B-Q is located somewhere on Highway 12 in Utah. Highway 12 runs for 122 miles from Panguitch to Torrey, Utah. 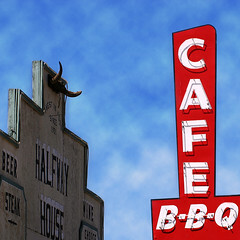 The locale used to film the Cafe B-B-Q is actually the Half Way House Cafe, located on Sierra Highway in Saugus, CA. The facility, in operation since 1931, received its name because it is the halfway point between Los Angeles and Palmdale. The neon "Cafe B-B-Q" sign is actually several feet away from the building. The external locale was also used in an episode of Ringer. Signs in the window of the cafe say "Keepsakes", "Gift Shop (Last Stop for 30 Miles)" and "Souvenirs (Treasures From Utah)". This page was last modified on 2 November 2011, at 04:29.